Recently state Senator Tom Lee proposed a Constitutional amendment that would end greyhound racing in the state of Florida. While the proposed amendment still has several legal steps to go before it reaches the ballot, some early polling suggests it would be approved by more than the required 60% of voters. Predictably, the greyhound racing industry has reached into its tired rhetorical grab bag in an attempt to muddy the waters on what is a straight forward effort to end the unnecessary suffering, injury and needless deaths of innocent greyhounds. Their basic strategy has always involved the following: change the subject and/or, predict economic catastrophe while at the same time engaging in personal attacks. The proposal is still in the initial stages of development and we have already seen racing proponents question the motivations of those supporting it as well as attempt to move the discussion away from greyhound welfare to topics like no kill shelters. It would seem if anyone’s motivation needed to be questioned it would be those who stand to make a profit from the continued exploitation of helpless greyhounds trapped in racing gulags across the state. With depressing regularity we read stories of greyhounds being drugged, abused and abandoned. Who could honestly argue for the continuation of this situation? What are their motivations? Another tactic the industry employs is to point the finger at other aspects of animal cruelty, for example the number of strays put down in shelters. Certainly no kill shelters are a good idea and should be pursued, but that is a separate conversation — especially since greyhounds seldom end up in shelters — which has nothing to do with ending racing. What are the motivations of those who would attempt to sideline the discussion of Senator Lee’s amendment for a different topic altogether? Every time the racing supporters perceive a threat they clamor that there will be massive unemployment and commercial devastation because of the indirect impact the industry has on local economies. The truth is most jobs are part time, low wage and offer few if any benefits. The real money is made by those at the top. For example, in West Virginia a study found that nearly half of the $15 million the state pays out in subsidies goes to 10 individuals. Certainly if greyhound racing ends in Florida some will lose their jobs, but the same thing happened in Iowa when the state withdrew its support, yet made sure that those who were adversely affected received a soft landing to help them transition. There is no reason to think the same wouldn’t happen in Florida. And while the industry does have an indirect effect on the economies around it, that effect is mitigated by the fact that it has to be propped up with subsidies from states and local casinos. In 2013, Florida spent as much as $3.3 million more regulating the so called sport than it took in through taxes. We predict that as this amendment moves through the process Senator Lee and those who stand with him will come under increasing personal attacks. Actually, it’s already started. I commented on an article about the amendment and I’ve been called a con man and a white collar criminal, accused of working for a ponzi scheme and challenged to meet “face to face” for what I imagine would not be a rational discussion of the issue. Verbal intimidation and name calling are common industry responses and are another attempt to change the subject. Florida political observer Joe Henderson gives the proposal no more than a 2 in 5 chance of success, but regardless of the odds it’s a sure bet the industry will pull out all the stops in its campaign of distraction, dissembling and character assassination. We cannot let this happen. Those who favor greyhound racing should be forced to account for the institutionalized cruelty, the callous disregard of health and welfare and the unnecessary pain and suffering endured by the helpless dogs in their so called care. The central question is this: Does a business that relies on the heartless exploitation of innocent living creatures for profit, and then abandons those creatures when they are no longer profitable have a place in Florida society today? ...ANYTHING TO EARN A BUCK? How about taking those "bucks" and putting them to positive use? 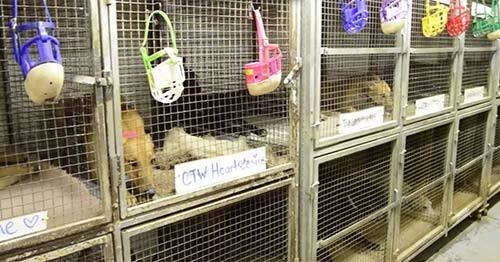 Spend them on these poor dogs, and not in the betting cages--why? BECAUSE THEY DESERVE BETTER and humanity can do greater good!